The company's shares fell victim to a broader sell-off in the tech sector. HubSpot Inc.'s (NYSE:HUBS) stock dropped by 10.1% in October, according to data provided by S&P Global Market Intelligence, as investors took a sharp turn away from technology stocks during the month. HubSpot's shares declined by more than 15% at the beginning of the month but had regained some ground by the end of October. 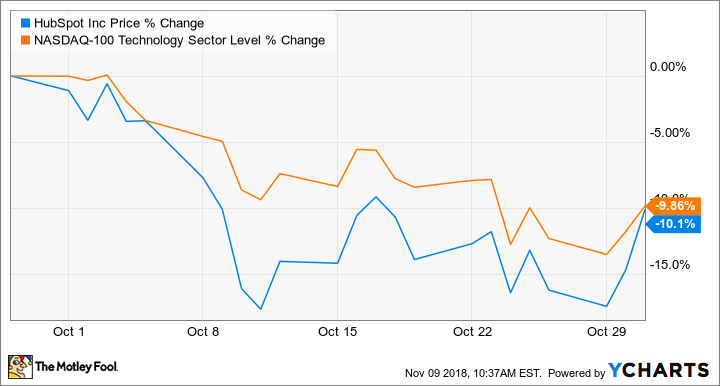 October was unkind to many technology stocks, and high-growth stocks like HubSpot were hit particularly hard as the overall market took a dip during the month. You can see that HubSpot's decline in October closely follows the fall of the Nasdaq-100 Technology Sector index. HubSpot's share price drop in October was certainly significant, but investors should keep in mind that there was no direct news to cause the company's shares to slip, meaning that any investing thesis investors have for the stock should remain unchanged. Additionally, it's worth pointing out that even with the decline in October, HubSpot's shares are still up about 60% over the past year. HubSpot's shares started rebounding a bit toward the end of October and through the beginning of November as investors anticipated positive news from the company's third-quarter earnings results. That optimism paid off, as the company's sales spiked 35% year over year to $131.8 million, beating management's estimates. Additionally, the company grew its subscription revenue by 35%, to $125.5 million, and non-GAAP earnings per share came in at $0.17, up from $0.03 in the year-ago quarter. With strong results in the third quarter and the recent sell-off tied so closely to a broader tech-sector drop, HubSpot investors shouldn't worry too much about the recent volatility.